Despite being the better team for long periods Wigan lacked a cutting edge and slumped to a 2-0 defeat at Upton Park. Both goals came against the run of play, one in each half by Matt Jarvis and Kevin Nolan. The Latics had controlled possession and created numerous chances but were unable to make their opportunities count. The result secures the Hammers Premier League status for another season, but pushes Wigan deeper into relegation trouble. Wigan made two changes to the starting line-up against Manchester City with Gary Caldwell replacing Jean Beausejour and Callum McManaman coming in for Franco Di Santo. 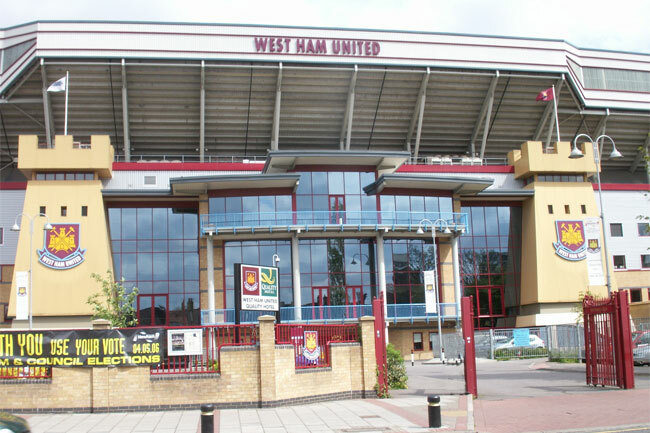 West Ham retained the same team which had held Manchester United 2-2. On a sunny day in East London Wigan made a confident start, retaining possession and pushing the home team deep into their own half. After only three minutes Antolin Alcaraz had a shot saved by the West Ham keeper Jussi Jaaskelainen. Maynor Figuroa and Arouna Kone got into good attacking positions but were unable to get a shot on target. But Wigan’s best chance came when Callum McManaman played in Shaun Maloney but the Scotsman could only fire straight into the midrift of the advancing Jaaskelainen. An innocuous challenge by Jordi Gomez on Guy Demel brought a petulant response from the Hammers defender as he punched the Spaniard in the face. Referee Swarbrick failed to punish the offence, which could on another day have resulted in a sending off. Wigan lost defender Antolin Alcaraz with an injury on 15 minutes when he was replaced by Jean Beausejour, and West Ham created their first opportunity when Andy Carroll’s effort was well saved by Joel Robles. The Latics responded with more pressure and from a free kick on the edge of the Hammers box, Shaun Maloney curled his shot just over the Hammers cross-bar. Carroll was booked for an elbow on Gary Caldwell, but the Latics onslaught on the Hammers goal continued with an excellent run and shot by Kone. On 21 minutes and against the run of play the Hammers took an undeserved lead. Matt Jarvis found room on the wing and produced an in-swinging cross, which looked to have been met by Kevin Nolan, but ultimately it evaded everyone including the Wigan keeper Joel Robles. It was a cruel set-back for Wigan but they continued to play their football and could have had a penalty when James McCarthy’s drive was fended away by Winston Reid but referee Swarbrick waved away appeals. Almost immediately West Ham had an appeal for a penalty when Nolan went down under a challenge for McCarthy. At half time Roberto Martinez made a tactical change and replaced the ineffective Callum McManaman with James McArthur and moved Jordi Gomez into a wider position. Wigan once again made a bright start with Gomez testing Jaaskelainen and Kone curled a left foot effort just over the angle of post and cross-bar. Wigan looked to have taken the lead when Maloney jinked his way into the West Ham box before picking out James McArthur but Jasskelainen produced an outstanding save to deny the Scottish midfielder. Wigan were constantly pressing but there was always the chance that West Ham could be dangerous on the break and they suffered a sucker punch when the Hammers broke away to consolidate their lead. A high ball into the box found Andy Carroll on the edge of the box and the on-loan striker’s overhead kick was met by Kevin Nolan who volleyed expertly past Robles and effectively killed off the contest. It was a bitter blow for the Latics who had been the better side, but could not make their superiority count. Their inability to finish their chances had cost them the three points. Results on the day did not go Wigan’s way, with Sunderland and Stoke City winning the prospects do not look good with five games remaining. But all is not lost and with fifteen points still to play for Wigan can still escape the drop. It is going to be close but I think they can do it and so should you. This entry was posted in Kevin Nolan, Matt Jarvis, Roberto Martinez, West Ham United, Wigan Athletic and tagged Kevin Nolan, Matt Jarvis, West Ham United, Wigan Athletic. Bookmark the permalink.